‘Welcome to Dreamland’! The Birmingham BC rolled out the red carpet and had lunch catered by Dreamland Barbeque. When I go to Horn Lake, I always try to get to ‘Corky’s’ and ‘Interstate’ which are two of the best barbeque places in Memphis. ‘Dreamland’ is Birmingham’s answer to barbeque. The bridge club is big and I think there were 25 tables and the ‘pride of Birmingham’, Frank Stewart also played. 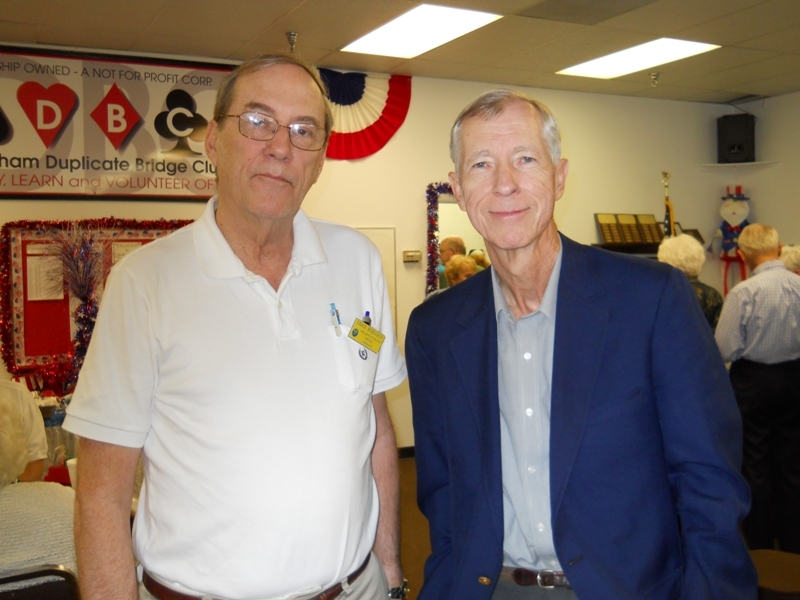 I got to speak to Frank about his days with the ACBL and his life today as a bridge columnist. I spent the night at the ‘Parrish Inn’ and played with Bill Parrish. A lot of Alabama’s best players came out and pummeled Bill and me. Special thanks Sandy Smith, club manager, whose efforts made this stop possible. We all need a good pummelling now and then. It keeps you humble. I see you have been following my blog. One of my problems in writing this blog is that I am saying things I don’t want to say but I am in a catch 22 situation. 1) I don’t like to say the people of xxxxxx went to a lot of trouble to have a nice party but if I don’t mention it, they will think I didn’t appreciate it. But now club yyyyy reads this and feels they need to do something. 2) The games I play are very important to those I am playing with. I play hard but my goal is neither to win or even win points but my padtner’s goal is to win and anything else often is a letdown. I only want to thank the clubs for the 12,000 new members they get to join the ACBL each year and meet as many members as I can.